NGOT has branched out from our standard content to provide a retail product review on Clinitote, a luxury medical apparel company, to propose a solution of keeping your clinical tools organized while remaining stylish on and off the clock. Projecting an image to a patient that you care about your physical appearance (good hygiene, genuine smile, unwrinkled scrubs, eye contact, etc) is vital to presenting yourself as a skilled professional. We at NGOT want our community of occupational therapy practitioners and other health care professionals to portray competence and confidence in their role. Founded and established in 2017 by Cami Culwell, an occupational therapist, who envisioned something more than the typical-issued medical bag, Clinitote offers a fashionable approach to functionality. As an OT, Cami did what we therapists do to assist our patients. 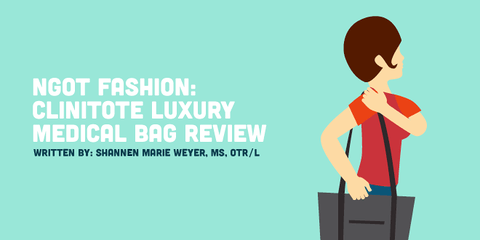 She saw a need, became an agent of change, and developed an intervention plan for herself to design a high-quality bag that better serves her peers. Her bags help manage productivity demands and in turn improve skilled services. At this time, the newly established company offers two distinct and practical luxury bag designs on The Original Collection line including the Original Carryall and the Original Messenger. Perhaps two of the greatest features of the bags are the easily wipeable nylon material and the multitude of compartments and pockets measured to fit our most utilized clinical tools (in addition to space for after work gym clothes and girly necessities). Also, each bag comes with two adjustable over the door Clinitote bag hangers to keep your bag clean, off the floor, and within easy reach. Below is an easy to reference chart to compare and contrast the bags regarding the dimensions and material. The Original Carryall is my favorite of the two from the Original Collection. Its name serves its purpose because let’s face it… it truly carries all my goodies both for therapy and for personal use (i.e goniometer, pulse oximeter, clipboard, tablet, Theraband, putty, fine motor manipulation and strengthening objects)! This bag is perfect for double teaming from day to night fashion. Day: Dress this bag down with scrubs for work or with yoga pants to run errands. At night, dress it up with a simple black dress and heels! The Original Messenger is all business. If you enter the hospital doors with this bag, you will appear ready for anything. Start your day off organized and give off a professional vibe. Quality over quantity. Yes, the bags are a bit pricey, but so is your degree. Quality investments do not always come cheap and it beats buying a not so cute and not so functional cheaper bag multiple times throughout your career. We invite the community of NGOT viewers a discounted price for apparel by Clinitote.